Stephen asked his cousin, Lexi, to go outside with him, ostensibly to show her the interior of his new VW Audi but actually to slip her some money. Unknown to him, Brenda, his wife was watching them from the living room window. Ten minutes later, Lexi came back from the nearby eatery with a bowl of ice cream and some cupcakes. She had spent the entire N1,000 Stephen gave her. She sat on the Audi’s bonnet and began to eat while Stephen chatted with her. Brenda had gone to check on her twins, Kachi and Buchi, chopping and blending ingredients in the kitchen but she was curious about what she had seen earlier. So she went to look out the living room window again and was scandalised by the sight before her. Unable to hold herself, she marched out to confront her husband. Stephen didn’t like his wife’s tone. She was talking about Lexi like she wasn’t there and she wasn’t even using her name. But he didn’t want a fight, so he replied, “Looks to me like ice cream and cake. What does it look like to you?” Perhaps, a little humour will help. But Brenda wasn’t in a laughing mood. As Brenda walked back to the house, Lexi started crying and Stephen sprang to hold and comfort her. A few minutes later, he followed his wife back into the house while the twins darted from the back door to join Lexi. He met Brenda completing the dusting of the furniture she was at before the whole drama began. 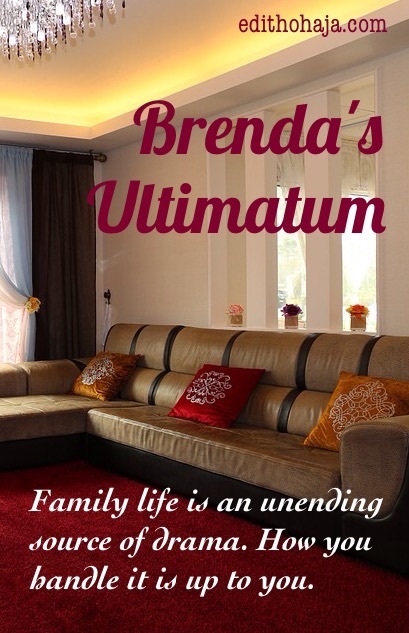 “The ultimatum, as you choose to call it, is for your cousin,” Brenda replied as she straightened up. Not one to be idle for a minute, she began fluffing up and repositioning their throw pillows. Stephen’s next move took his wife by surprise. He closed the distance between them in quick strides and scooped her up into his arms. After he’d planted a kiss on her left temple, he tried to turn her around for more but she wriggled free and ran into the kitchen. He chased after her and collided with the kitchen table upending the tray of ingredients the twins had prepared. “There goes your breakfast!” He went and opened the front door. “Come on, everyone, get ready. We’re eating out,” he announced. The twins, who had been eating with Lexi, squealed in delight. The younger of the two, Buchi, grabbed the ice cream bowl and bolted indoors. The older, Kachi, wanted to pursue him but Lexi offered her the last cupcake. They both went in to prepare for their outing. “Hi!” Brenda threw to Lexi as she came to drop the paper bag the cakes came in into the trash can in the kitchen. “We better hurry or your cousin will make us walk.” The same guy who just called me a drill sergeant! “Yes,” Lexi replied, remembering how she and Brenda walked to church the previous Sunday for being late. She smiled and they both rushed towards their bedrooms. You’ve probably seen disagreements and arguments in your own family. Care to give us an example (what it was about and how it was resolved)? Do you have any “drill sergeant” in your family? What do you like and what do you dislike about their behaviour? Always a pleasure to read your writing and be challenged! I am the drill sergeant in our household! I am the Martha and need more Mary moments. Thank you for this reminder to slow down and take time to be with the Lexi's in my life! So glad to have you here, Sarah! Some of us need a little bit of Martha to prevent everything around us going to the dogs. Blessings on you and your family in Jesus' name. Lolzzzzz.YES there is indeed palaver in every family.Brenda managed it well and thank God for her husband who understood the type of woman he married. Yes,,my dear! In some families, minor issues escalate into major fights from day to day because of lack of understanding. God bless you! This sounds like my husband and I. Praise God! And blessings on you and your family, Brittany! Wow...this is a very smart and brilliant way of settling family problems...Thank God for Stephen's wisdom. I really love this story. Thank God indeed! Instead of focusing on his wife's seeming dislike of his cousin, he addressed the underlying problem: her rigid way or running their home. The wife too gave in without gragra. May God grant us the wisdom to work for peace with those we relate with in Jesus' name. A good one again. You really do fascinate me with your stories. What a nice way to settle a family dispute! This is a home with mutual understanding and respect. Glory to God, my dear! Anything at all can lead to a nasty and prolonged quarrel when the people involved are stubborn, disrespectful and unkind. None of us is perfect. We should need to find ways of living harmoniously with one another. God bless you richly in Jesus' name. In a family, misunderstanding must come from any party but the solution to that is understanding. once either of the parties can understand and tolerate, peace will exist. Hmmm, thnk God Stephen understands. Yes, he does! He is a good husband. The wife is reasonable too, though she was flexing her muscles initially. This story is so fascinating, such a family that knows how to control themselves when angry is so ideal. What a happy home!!! Wish all homes were like that but alas, people can quarrel over the most insignificant things and keep at it like forever. Wow! I love how Stephen took control of the matter by calming Brenda down. Stephen is a cool and matured man. Not all women are lucky to have a man like Stephen. I love this story. It's a nice one. Glad you love the story. May we all be the bigger person or the one that sues for peace in our relationships. I think married couples should read this story. It's a nice story. I learnt from that we should not always take little matters to heart. We should learn how to handle and take control of issues the way Stephen did. Thank God for a self-controlled and sensible guy like Stephen. God bless you, Chiamaka! Bless you, Chinonye! There's bound to be friction and issues cropping up when people stay together. We just need to remember that we are called to be peacemakers. Yes o... We have a Lexi in our home... She used to be the last born until surprisingly, our number was increased. She still has this last born mentality... Hates work and falls sick when one is imposed on her... This attitude of hers irritates me, I believe all is pretense and so I make her do things as she ought.. She doesn't have to be told anymore.. Cos she knows I've got my eyes on her... This story, though meant for couples, teaches patience and accommodation to all... More inspiration, Ma. I love your comment, Ebube. I hope you were not too hard on your Lexi. Nice one aunty. I will say that sometimes I am the drill sergeant not every time though. Seriously she was harsh out there. In a way, yes. But I prefer people who speak their mind like that to those who keep quiet and bear a grudge. At least, you know where you stand with the former and can tell what they want/how to fix a rift. Pretending and keeping malice at home is bad but we should still air our grievances with respect. This story is very mature it reminds me of some issues that due occur in some homes whereby when relatives visit their aunt or uncle there is always an argument is either the woman will be against what the man wants or the other way ,but in this aspect the man handled it in a way that shows that he is educated.thank God peace at last. Understanding in marriage matters a lot and that was the key Stephen used to bring back peace in his home. Although issues come up at any time at home but the most important thing is how to manage them. Bless you ma. Our last child is a typical "Lexi" .he's been around for just 13years and he throws tantrums all the time.my mum always has to give him ultimatums to get him to do anything at all.He simply hates chores. I believe he'll change.he's just a work in progress right now!Thanks for sharing this family story ma!! Yes, people do change. When some responsible people tell us of the trouble they frequently got into when they were young, we find it hard to believe. So we need to be patient with the young. God bless you superbly, Jay! Stephen was mature in the way he handled the situation. True. You are blessed, Nkemdilim! couples should know how to manage their family crisis in such a way that it won't cause trouble. loving this story. Having a Lexi in the family can really be frustrating but it is always good to approach them with love and they will come to thier senses. Not only in Brenda's family.Almost in every home there are misunderstanding and disagreement.Only those that cherish God's principles set out in the bible allow it to guide them. In marriage, husband and wife are supposed to understand each other and cooperate in order to have a peaceful home. It's like you've taken a course in Sociology, Ginika! Lol! You are highly blessed in Jesus' name. wow this story is striking. this kind of thing happens in most homes, and to the glory of God in mine, we handle it with love just like Stephen did. this used to be my family when i was much younger,the family order and organization Brenda created and tried to maintain was my mom's way of keeping her sanity intact because running the home was a full time job, coupled with the fact that she was also working. i can relate with Brenda's annoyance as regards her husband's action, if the issue wasn't trashed out, Lexi would have begun to see her in a bad light, without understanding the reasons for her actions. In all, there should be room for compromise, it goes a long way. Good job ma! I love the way it ended. I am the drill sergeant in the house. Lol. But brenda's attitude towards her husband and his cousin doesn't speak well of trying to put everyone in order. She is lucky to have married someone like stephen who understands what a good marriage is. Okayooooo. I will say this though. I hate to see that when home chores are done, then someone will instead of helping out turn it to be his or her leisure time for doing all sorts of things that will not help at all. Truly, I will lash out, I would be so mad at that person at that point in time as Brenda was. But it's so good to know that after being mad,she still kept it together and had a healthy relationship with her. Kudos to Stephen for handling the situation and not allowing it escalate..
lolz! in every family there are usually misunderstandings. hmmm, that is a very interesting way to settle disputes between couples in their various homes. all the quyz reading this should learn ooo. 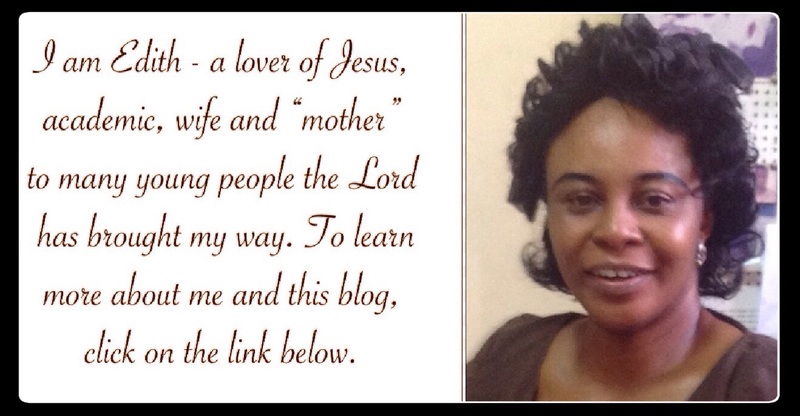 this is a nice one, God bless you ma. Wow!!! Am falling in love with Stephen... Loves the way he tackled the problem... Anyway the story is interesting. A very good story for both the married and unmarried. Having self control and understanding is what sustains and keeps people's marriage. family will always have its ups and down; but theyshould be settled as they occur. Love the story. communication, respect, understanding, forgiveness and humility are solid grounds where peace can thrive in a family. kudos to the man of the house. In every marriage, the couple need to understand each other. Stephen was very mature in the way he handled the issue. Nice story, ma!! You're right. God bless you, Nkiru! Yes ooo am the drill sergeant in my family, my mum often gives me a thumbs up on how i try to put things in order because i have very lazy siblings. The ability to make things fall back in place is an amazing part of a drill sergeant other than carrying a long face all day. the story is lovely and outstanding. Keep it up, girl, and stay blessed! Lovely story! What a nice family that can control their anger when temptation comes their way. The drill sergeant in my family is my mum☺. She loves it when we keep to her rules. At times, i feel like she is too controling.Well, the Lexi in my family is the last born. He won't do anything at home, we don't get along well because when he refuses to do anything at home, I will have to do it myself and it can be very tiring. misunderstandings are bound to arise in every family but it takes a whole lot of understanding, maturity and compromise to be able to settle them. i love the fact that Stephen did not scold his wife in the presence of Lexi and the fact that he was still able to settle with his wife amicably showing that they both loved and understood each other. What a lovely home, It is true that misunderstanding and problem is prone to come in every family but what matters most is how well were they able to be resolved? Stephen is just a typical example of a good husband,kudos for him! The message is very clear. And it's deeprooted in the family leadership. Governance that is good begins at home as extracted from the story of Stephen and his family. Family organization is the bed on which the success of leadership lies. It will be beguiling solving family problems by looking inwardly. This is a beautiful concept rare as a gem coming from this blog. The family journey maybe hard but members of the house's lust for happiness should be definite. A lesson to teach before success in any society. For success is equal to happiness. Meaning a happy home is a successful home. Na wa oh! Oyibo dey here oh, lol! Nice one ma!! This is so real to me cos in every family, there must be someone who hates house chores like Lexi, u always feel cheated wen u work and another person z jhs there to enjoy........there should be division of work to avert dz kind of situation though misunderstanding in inevitable in a family but wen duties are specified, it goes a long way in controlling that.....kudos to Stephen for settling the problem amicably..
We had a similar issue some years back, when two of my mum's nephews and two of my dad's nephews had to stay with us for the duration of their post utme. It wasn't funny at all but it ended well and having read this story I think it is because neither of my parents were drill sergeants. There is nothing as wonderful as understanding in your home. You have to learn to understand those around you in order to have a happy life. Thanks a lot Ma, I was really educated by reading this. the important thing here for me is to understand that people are not the same. As a mother, Brenda needs to understand that and know how to treat each person accordingly so as to avoid situations like this. most times, this drill sergeant behaviour is needed as it ensures order in the home. I am a 'Lexi' ?. Though I only like to clean. But never ask or expect me to help cook or wash. No, thank you. But my mum, the drill seargent, will bundle me into the kitchen and make me do all those. Somebody cannot even be lazy in peace again. (Joke! ?) Thank God for how Stephen handled the situation. This greatly captured domestic life. Thanks, ma! people born with silver spoons find it hard to adapt to new changes, just like the case of Lexi, in case we come across such people, they should be handled with care. we sure do have a drill sergeant in the house, that is my immediate elder sister, she is the son, brother we never had, she doesn't take nonsense from anybody be you who, she fights for her nine sisters and parents, she has even involved in a physical combat with a guy in the village who used to torment my life, and reduced him to a chaff. hahhahahaha i cant forget the day she chased four titled men away from the house with a machet for trying to talk my father into getting a new wife. yea i admire her so much because she is ready for the outcome of whatsoever, am proud to have her as a sister. I think every home has a 'lexi', but in my own home,am always the drill sergeant!!! Thank God for Stephen's understanding and the grace that gave Brenda that type of man. I love the acknowledgement that it's grace that brings good things into our lives. You are lifted in Jesus' name. This piece is really interesting....I really love the "Stephen"character ...I wish all men are that way.the truth is we women to an extent don't know that we are somehow trouble personified but it takes a gentleman who understands that no matter what a woman is always a woman and the ability to be calm when they are in their heated period. Thumbs up ma! In every family including mine, there is always a misunderstanding, it is important to handle every issue with maturity like Stephen did. MY COUSIN THAT IS STAYING WITH US AT MY AUNTY'S PLACE IS LIKE THAT. HE DOESNT LIKE DOING MUCH WORK AT HOME. ONCE HE IS TIRED OR DOESN'T WANT TO DO ANYTHING, HE WILL PRETEND HE IS SICK. BUT MUMMY TRUST ME, I WILL OFFER DRUGS TO HIM AND HE WILL TRY TO REJECT IT AND I WILL INSIST. HE HAS TO ACCEPT THE OFFER OR I WILL SCARTER HIS PLANS. I LOVE THIS STORY, HE REALLY NEEDS TO SEE IT. THIS IS QUITE AN AMAZING STORY. I KNOW MOST FAMILIES FACE THIS KIND OF FUNNY PLAY. IT TAKES WISDOM TO HANDLE SUCH AN ISSUE. I understand how men are solely the main contributor in spoiling a child while growing up but wen the child is grown and finally spoilt its the woman's fault? Lexi a 17 year old outside licking icecream, while her aunt is in the kitchen cooking? Amazing! Everybody should have just had icecream for breakfast nah. i really love this story. first the reaction of Brenda. i like it because if she had not said anything lexi will not join in the house chores and also the approach of the husband towards the wife is wonderful not raising his voice because it would have caused a big problem in the house. i like the family there is respect and understanding. the story is very nice and interesting. reminds me of how tough my mother can be sometimes but still she loves us and everything she does is to make us better. Lol. This reminds me of home. How my mum would share out various chores on pieces of paper, fold them and make us pick our work in turns. She's indeed the drill sergeant. You have no reason to dodge work Stephen is just the ideal man for her. We thank God for wisdom and understanding. Something as little as that could as much as lead to divorce in some families. Nice piece Ma!! 'What is good for the goose is good for the gander'! It's good he took everyone out so that they will all feel loved. Besides, I think we should all learn how to adapt to situations when we go to places and meet things different from the way they are in our various homes because in it lies a sense of maturity. If Lexi had adapted, he wouldn't have had much difficulty copying with her uncle's family. This story reminds me of how my younger sister tries to dodge house work. The fact that Brenda was able to say what she thought about Lexi not helping with the housework was mature and the way Stephen handled it was commendable. It shows a level of understanding between the two. I really love this story, ma, it's enlightening. But I think in Lexi's case, she should learn to adjust. As humans we have the capability to adjust to new surroundings and situations, so the idea of adjusting to Brenda's rules doesn't sound bad to me. And that's what I call understanding and conversing. Without these two in a relationship, nothing tends to work out well. And The Stephens got it all. Kudos ma. In my home, we've had disagreements, but the main drill sergeant in the house is my dad, he tries his best to make everything fall in place. There's no particular Lexi in my home, there are times all of us will be lazy (from dad to the last born) and times we're all up and doing, it all depends on the mood. The story is realy inspiring. I really love the way Stephen handled the situation. This is because he understood his wife. The drill sergeant in my house would be my elder sister. She cannot stand to see even a cup out of place. She yells at us just to get the work done and if you aren't interested in cleaning with others, she firmly but gently, pushes you out of the house. Lol. I'm not in support of Stephen giving his niece money to get something to eat while preparation for cooking is underway. But I like the way he handled the situation at the end. It shows that he really understands his wife. This is interesting and honestly I know how it feels for one to do all the chores in the house and then your cousin or visitor just sits and relaxes expecting you to finish up and call her to break bread with the rest of the family. I think the man applied wisdom by agreeing to let Lexi do some of the home chores alongside his wife and children. Nice one, ma'am! Brenda seems to be an upright woman and i am glad her husband knows how to calm her down. this story reminds me of my elder sister LOL. Beautiful write up. I love the way Brenda spoke to the husband candidly even before the little cousin to drive home her point. The way they both handled the issue afterwards and it outcome was also nice...I enjoyed it. Understanding breeds a successful relationship between partners as Stephen and Brenda can attest in this short story. It is good for a husband and wife to know the easy way to settle dispute amongst themselves and still maintain love in their family. I guess what Brenda has in terms of a marital relationship is the dream of girls like me. I doubt that being hard would affect anybody, besides everyone needs a little discipline sometimes. Didn't know you were a girl. I must say you've been doing a fine job at hiding it. Lol! Nice one ma. No family is without issues but what matters the most is how those issues are being ironed out. The family is not a place to showcase anger,temper or to bear grudges. If Stephen had approached the matter differently, there probably would have a whole drama which could result to other unnecessary things. Also,Brenda and Lexi were softhearted enough to talk to each other just after the yelling... That's how a family should be. Misunderstanding is inevitable in every family the solution is to adjust and respect evey one opinion. Thank you ma for the post. Wow! This is a nice story. This is a simple way on how to settle family issues instead of involving the whole villagers. Stephen is really a wonderful man who knows how to handle different situations. Lol.. Yes there is a drill Sergeant in my family and that's my mom. She likes to run a tight ship and mess ups are not allowed. Stephen is a very patient man who knows how to defuse an argument. I love this post, thanks a lot ma. Lexi in my family? No way, Mama would hit it off you. Though, I have Lexi as a Cousin, she didn't last long with us (my family) she just stayed for two weeks, she couldn't cope then she left.... Power to Brenda's understanding Husband (Stephen) who settled things with the wife without a fight or long argument because some husband would mistake Brenda's action as being too disrespecting or commanding. Brenda was a bit uptight but Stephen did well in explaining things to her and making her see reasons with him. All family have their ups and downs so Stephen did well in conversing and reasoning with her. wow. This is fascinating and educating. At home, I'm the 'drill sergeant', I expect things to be done at the right time without excuses. And our last born is the 'Lexi' in the house. It is really, really frustrating...most times you have to scream your head off before she does a single chore at home. Thanks for my dad who's always there to help stop the misunderstanding from lingering. Thanks ma for this interesting story. The marriage experience is never without occasions of misunderstanding, quarrels ;that spices up the experience, entirely. However, it is important that couples learn how to quell these misunderstandings whenever they erupt. Arguments happens all the time in the family and outside the family but it shouldn't be a barrier to being a drill sergeant when necessary because most times when you keep quiet on some issues, you might be taken for granted but as long as those problems are settled and not allowed to escalate, I believe they are normal..thank you ma for the wonderful post.. I believe that in every family, there is always a Brenda but it is advisable for them the drill sergeant to take it easy. I love how Stephen struck a deal with Brenda and of course the way Lexi didn't brood over the way her cousin's wife shouted at her. In every marriage they must be a misunderstanding but wnt matters is how you settle the problem. Stephen was able to settled the misunderstanding in a matured way knowing how his wife behaves. No family is devoid of problem. The main issue is learning how to control the situations in the family. I really commend Stephen for the action he took instead of applyimg aggression like many other men would have. Brenda was right, one should contribute and give helping hands when you are in another person's roof. The couple resolved their issues well without letting it linger for long. Well, the attitude put up by Brenda is not strange because it is common to some few women out there .The husband acted like a man which shows that he is carrying out his responsibilities effectively as the head of the house with caution and mood moderation towards solving the problem that came up.There is a huge lesson to capture from this story which is the ability of a man to build up a cheerful home with such a diplomatic concept of approaching and tackling family issues and misunderstanding. Thank God for a better understanding between the couples. The sure handled the issue properly not hurting anyone or extending the argument. There should be division of labour in the family. Work shouldn't be left for one person only. Nice one ma. Stephen really knows how to make peace and ease up his wife despite her boot camp approach to. In every marriage there must be one problem or the other.. Your ability to settle this problem within yourself makes your marriage better. I like that Brenda was willing to compromise and make a deal that would endure peace in the house for everyone and not try to pitt her husband against his cousin. Nice story! It is very good to marry an understanding husband,thats why Brenda was lucky. and with God her marriage was blessed. Lovely story! One thing to expect in every family is issues,then it becomes a problem when we allow it to linger.Stephen is a wise man... Brenda did the right thing, it is good to discourage laziness. I like the way Brenda took the bull by its horn if she didn't , some of these nonchalant attitudes Lexi was exhibiting would have grew more annoying . We should always speak out when we see something wrong happening no matter how close you are with such people. There is nothing like maturity in handling marriage problems. Brenda and her husband, Stephen handled the situation maturely and it turned out well. Brenda has every right to do what she did because a home should be ran efficiently with every member of the house being up and doing.......Steve handled the matter with a matured mind although he almost flopped by giving Lexi money that morning to get pastries when her aunty was in the kitchen with the twins......Understanding in the family matters a lot. This story is very captivating. It is humorous as well as lesson-filled. Family can be a bit overbearing at times but you can't help but feel the love. I enjoyed everybit of Brenda's ultimatum. This story is indeed educative which everyone needs to read for Peace and love to always reign in the family . This kind of thing have happened in my family but thank God it was settled immediately just like Stephen did for Peace to reign. Nice write up, you were able to entertain and educate us at the same time compelling us to look into our lives, that's beautiful. Wow..........this is really an interesting and educating story that helps to control conflict in a home. It is natural that in every marriage, there must be misunderstanding and what settles the matter is the ability of the couples to understand and tolerate each other. Thanks for this realistic story Ma. Is good that Stephen and Brenda ended up understanding each other which is very very important between couples because I personally feel good whenever I see my parents haven quarrelled some minutes ago, are seen gisting and laughing. LET LOVE LEAD!!! the way the situation was been handled by the couple shows maturity and the understanding that exist between them. if only those who are in a relationship could understand each other, I believe that there will be a decrease in the number of break up and homes. Stephen really showed maturity on how he handled the case In every marriage or relationship there must always be misunderstanding but What matters is how the issue is resolved at last, every couple should be able to understand eachother just as Stephen and Brenda had done in the story. Thanks so much for that wonderful and educative story MA. Our last born (aka the usual 'Lexi' in every family) never did his share of house work. In short, Saturdays were 'Tom and Jerry- starring the Achugwos'. I got tired of it all and tried a different approach. I and my other brother would work together while talking and laughing, and 'Lexi' would watch TV. After a while, I'd secretly switch off the power or NEPA would do the favour. He'd try to join the conversation and we'd tell him it was "workers only". When we eventually let him in, we'd ask him bring to bring this or arrange that until we got him to fully join in. House chores done with family is a great way to bond. Stephen handled the situation nicely but that will not make Lexi automatically change and start loving house work, or stop his wife from getting angry the next time it happens. They can't always just eat out. If Stephen joins in, and Brenda is less "drill sergeanty" Lexi would most probably help out too and there'd be more love and fun on Saturday! Wow! This story really got me thinking. I love the way Brenda and her husband, Stephen resolved the case. There are children like Lexi who do not do house chores. It is important for every child to learn how to do chores. most families don't actually get along and some even end up breaking up because they don't know how to resolve minor issues. Brenda's family is a kind of family that has understanding and her husband also is a man who knows how to handle cases mildly without offending anybody, and that is one major thing that has sustained his family. I think families should learn from their example. Every family has rules and for peace to reign, you have to play by the rules of the family you find yourself in. Brenda was just trying to make Lexi understand the saying "When in Rome, behave like the Romans". I love the way Stephen handled the situation. I just enjoyed reading about the ladies settling their issues, after all what is family without peace? For Brenda,everything in the house is to be done and shared equally, no one is left out,the way her husband was able to respect her decisions shows that he has a lot of respect for whom he married. Its best to understand one's family unless you are ready to put it in jeopardy. UThere is something called home training, anyone who is born on earth and into a family has to do one thing or the other no matter how small to help out in the family affairs. Brenda is completely right in this story by trying to correct Lexi of her behaviour because she is a woman and she cares. Lexi is a girl who in a matter of time will grow up to be a woman and she will have her own husband, home and children, its what she learnt when she was young that she will display when she grows and will also lead her in marriage. For me whether in your biological home or not, you need to show home training. Assuming Lexi finishes her education and gets married and life is not what it seemed to be in her father's house, what will be her fate? Therefore all hands should be on deck. Understanding is the key in every family and relationship. When there is misunderstanding, the family will be a war zone. Before a family can grow, the couple must learn to tolerate and understand each other. Without that, the family will be far from peaceful. sometimes disagreement arises between couples but it takes understanding and love to settle everything amicably. Also having self control is another thing that keeps marriage. Wow! an interesting story for both singles and married people. it is a true fact that problems or misunderstanding are prone to happen in a family but it takes maturity, understanding and the grace of God to withstand and conquer such situations when it comes. Like Lexi, I'm also a 'daddies girl'. When I was younger, I never took corrections given to me in my dads presence cause he always supported me.What Brenda would have is call her husband aside and talk to him then later he would inform Lexi of what her new routine.At the end of the day, Lexi is corrected and everyone is happy. My parish priest would always say ''for peace to reign,one person has to play the fool''. Brenda's husband sure did play that role well. Oh yeah!!!.... I have two wonderful drill sergeants. Am I fortunate to have them? I really can't tell. The fact that they are strong, independent, hard driving cholerics can be very annoying. What I love most about their behavior is their persistence, orderliness and set principles. However, I honestly dislike intact I detest the fact that they give little or no room for your opinion. Their motto is simply: "you are to be seen not heard". I love this. Brenda is a real drill sergeant but I love the way her husband handled the situation, and Brenda having laid down a rule acted as a real woman by quickly getting along with Lexi . She did make up with Lexi towards the end. And she agreed to her husband's terms. That's the liberality you seek right there. Lol! I like the way Brenda took the bull by the horns. If she didn't, some of those nonchalant behaviours Lexi was exhibiting would have grown annoyingly. We should always speak out when we see something wrong happening no matter how close you are with such people. The story is really educative. Everyone needs to read this for peace and love to always reign in their homes. Wow.......... This story is really interesting, inspiring and educating I really love how Brenda and the husband treated the case that arose in their family. This show that there is understanding and tolerance between the couple which is the key to a successful home. Every family has a problem. I would like to use mine as an example. My parents almost lost their marriage of 17Yrs due to an issue like this, my Dad was always in support of his neice even when she does things that are bad..... My Mom never liked it and it almost resulted to a fight, stuffs started happening, things that happened even before they got married were brought back to the picture but it took the grace of God to actually settle it. I like the way Brenda handled the matter but it also took the brains of her husband to resolve the issue amicably because stuffs like that require a wise person to handle them that way. In a family how one governs his or her temper is very important. I admire Brenda's bravery of speaking her mind, am in full support of what she did. Stephen wouldn't have acted that way, he would have at least considered other people. But at the end I loved how Stephen handled the issue it shows his level of maturity and responsibility. He made it up to everyone. I really admire the way Stephen and Brenda handled their argument. It indeed shows some level of maturity. I couldn't help but yo notice Stephen's approach to their argument. He tried as much as possible to bring his points to the fore while trying not to be offensive.This indeed saved them alot of trouble and prevented what would have seem to be 'family palaver'. If this move is imbibed in our contemporary families, I believe alot of ' wahala' will be avoided. Understanding is key in every relationship.Stephen by his action made it worse. brenda is right even though she took it to another level. He should not have gone outside with lexi. they should just have been patience.But nevertheless, women are protective of everything. understanding is highly required in every union.Brenda was right owing to the fact that the had a tradition in their home.Stephen shouldn't have taken lexi out.but though Brenda behaviour was harsh to lexi, it was understandable as little thing like this could cripple a marriage without them knowing. I love this family. They were able to handle the situation amicably. Understanding works like magic in most relationships today. Brenda and her husband settled the situation in a better way which brought about peace in the family. Not understanding your partner would definitely lead to chaos all the time. Almost every family have likely problems but if you refuse to be a succumber,you're always feeling on top then sorry for quarrels shall remain inevitable in your unbalanced home. Nice morals! Its good to understand your partner and know the best way to resolve issues. Wants someone like Stephen. The story is nice and can be related to the real world in the way Brenda's husband did what he did and the way Brenda went about the matter. I support the way they easily solved their problem.